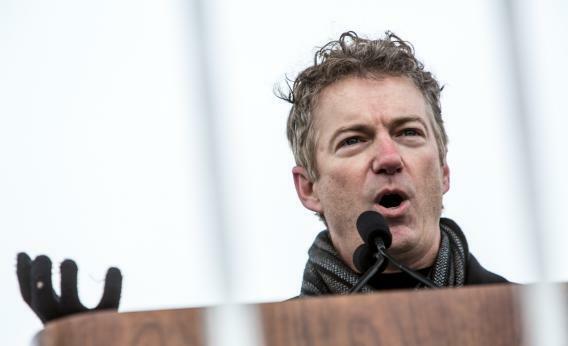 Rand Paul to give Tea Party's State of the Union response. Sen. Rand Paul (R-KY) speaks at the March for Life on January 25, 2013 in Washington, DC. The pro-life gathering is held each year around the anniversary of the Roe v. Wade Supreme Court decision. Sen. Rand Paul is giving tonight’s annual “Tea Party response to the State of the Union,” a gimmicky tradition started by Rep. Michele Bachmann in 2011. The press wants to write a “GOP in disarray” story—“Is Paul the voice of the party, or is the actual GOP response-giver Marco Rubio?”—and this is doing the trick. Liberals are piling on; union flack Eddie Vale says the the GOP is a “House divided,” and that Rubio, a “Tea Party darling,” is being undermined. Well. The Tea Party response was always overhyped as a symbol of GOP division. In 2011, with interest in the movement peaking, networks cut to Bachmann right after Rep. Paul Ryan was finished giving the official Republican response. If anyone remembers the Bachmann speech, it’s for a logistical issue that made Bachmann look at the wrong camera—the web stream camera—instead of the TV camera. But the wholly forgotten speech didn’t contradict Ryan at all. It was five minutes of “the debt will kill us”-style rhetoric, with some extra flourishes (warning of “16,500 IRS agents in charge of policing President Obama’s health care bill”), but nothing about social issues. I’ve asked CNN what their broadcast plans are for this Paul speech, and if this will be streamed beyond RedState.com and TeaPartyExpress.org. But if past is prologue, this won’t step on the GOP’s message at all.